The prosperity of Tokoname stems from its port from which its pottery products have been transported to every corner of Japan.Tokoname has a pottery heritage dating back to about 1100 AD.In Japan there are six ancient areas of pottery-Tokoname,Seto,Echizen,Shigaraki,Tanba,and Bizen. Of these, Tokoname has proven to be the oldest and largest in terms of its scale of kilns.Up to the Edo period Tokoname played an important role as one of the leading kiln sites rized by a powerful sense of form. And the end of the Edo period the production of red earthenware teapots are sold throughout Japan. Thus, it can safely be said that the history of Tokoname rests on the potter's clay. Tokoname City is located in the hills on the west coast of Chita Penninsula which faces lse Bay. It is a long and narrow town running 6 kilometers East to West, and 15 kilometers North to South. The name "Tokoname" first appeared in "Oharidano mashimizu" (an old document) as "Tokoname go Tsutsumida sho, Chita-Gun, Owari-Kuni" on May 13, the 4th year of Oei (1397). The city was called Tokonabe a long time ago, but is now called Tokoname. It is not exaggerating to say that the history of Tokoname is the history of Ceramics. Medieval Tokoname pottery, which began about 900 years ago, mainly produced miscellaneous vessels like large earthen pots and cups that were used for everyday purposes. The tradition has been passed on to the present in some of the leading products of Tokoname ceramics like the eathenware pipes, and red clay pottery, Tiles, Bricks and sanitary ceramics after. And new fields are likely to be developed by ceramic artists. The beginnings of the Tokoname kilns are believed to date from about 1,100 A.D., and are probably the oldest kilns in the history of Japanese ceramics. An estimated 3,00O kilns existed in large scale through the Heian and Kamakura periods (794-1333) and their remains have been discovered in various places, from Hiroshima prefecture, east and northwards to Aomori prefecture, recalling their once glorious days. Sherds found at these places are mostly from vessels for Shinto or Buddhist altar rituals including the pieces used at graves and sutra-mounds. The early Tokoname ware is a coarse, greyish clay, burnt dark brown all over. It is rough in appearance, untrammeled in concept, and stands out powerfully as a masculine sense of form. Every old piece is partly covered with a green ash glaze which runs in small rivulets down the side in three or four places. Since the products from the early Tokoname kilns in the Heian, Kamakura and Muromachi periods (794-1573) are mostly vases and jars, it was once thought that production of early Tokoname ware was limited only to these two shapes. However, Yama-Chawan (mountain tea bowl) were fired in great quantities and sherds of the mountain tea bowl have been found at many kiln sites. The style of the mountain tea bowl is coarse in appearance and its trumpet mouth rim is not tapered but terminates in an abrupt 90o lip edge. The base of the tea bowl, which was formed separately and later attached to the body, shows places where chaff-remains stuck after firing. Besides the above pieces, large flat bowls, dishes, roof tiles for Buddhist temples, lipped bowls, cooking pots and other various utensils for daily use were produced and fired in anagama kilns (tunneled sloping Kilns) located along the ridge of hill running through the central Chita peninsula. These products of the Heian and Kamakura periods (794-1333) are mostly fine pieces. In the Muromachi period (1392-1573), pit kilns were replaced by surface kilns at Tokoname village. Vases and jars which had clay containing iron oxide were fired and burnt black all over, showing one of the characteristics of Tokoname ware. Examples of these are found in the Tokai and Hokuriku Areas. During this period, Mizuno Kenmotsu, better known as Lord Tokoname, cultivated the friendship of such prominent men as Rikyu, Sokan, and Myokian Hoshuku to whom he introduced many fine Tokoname vases of earlier periods. 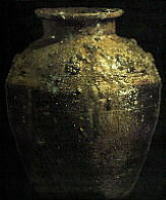 One of the most famous pieces is a water jar once owned by Rikyu. It was named "Fushiki", and has been handed down for generations in the Sen family. This Tokoname jar was produced in the late Kamakura period and as the tea ceremony gained popularity during the Edo period, water jars of the "Fushiki" type were made in large quantities in Tokoname. Watanabe Yahei, who was active during the Tenmei era (1781-1789), was given by Lord Owari the title of "Tokoname Genkosai". He was the first potter who singed his name to Totoname ware. There were many potters who produced utensils for the tea ceremony in the middle of the Edo period, with Kamimura Hakuo being one of the representative potters of this group. He was active during the Bunka era (1804-1816) and associated with cultured men in Kyoto and Edo. He used two names, either"To Hakushi"or"To Hakuo"in signing his work. About the same period, Priest Seishu, who was the 8th generation of the Soshinji temple, had his own kiln within the precinct and made low fired pottery. He instructed both Ina Choza and Akai Tozen, who became prominent potters of Tokoname ware thereafter. Tozen I was a special potter who made a pottery wind furnace for Lord Owari and thus he was given the title of "Master of the Wind Furnace, Akai Tozen". 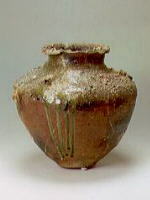 Tozen II was also an excellent potter as was Ina Choza II, who originated the "Mogake" glaze. For this glaze, the bisquit ware is partially covered with seaweed, then fired in the kiln, leaving red markings where the seaweed once was. Many excellent potters, including Matsushita Sanko, have followed in the tradition of the artists mentioned. Koie Hokyu and his son, Hoju, were the leading ceramists at the end of the Edo period. At that time, Tokoname ware made remarkable progress when viewed from the technical and artistic points of view. It was in this age that the nobori-gama (sloping chambered kiln) was introduced at Tokoname village while Sugie Jumon succeeded in producing small delicate pottery vessels for the Chinese style green tea ceremony under the guidance of Hirano Chuji, a physician of the time. In the 11th year of Meiji (1878), a Chinese gentleman, Chin Shin Heng, visited Tokoname village by chance. He taught Jumon the technique of the Chinese I-hsing ware. Jumon became very famous for his copies of the I-hsing pot and they were much appreciated by his contemporaries. In the 16th year of Meiji (1883), the Research Institute of Art was established at Tokoname and after Naito Kakurei and Terauchi Hangetsu took over thier positions at the institute, they reformed the Tokoname ceramic industry. 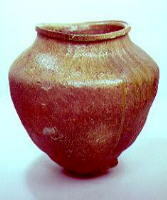 Naito Kakurei introduced a Western manner of sculptural pottery into Tokoname ware. Tomimoto Baigetsu was one of the famous artists in this group. In the 2nd year of Taisho (1913), Hirano Kasho made a pottery figure of Koie Hoju, which stands 2.6 meters in height and shows great influence from the above artists. This piece is considered as one of the representative ceramic sculpture figures in Japan today. At the end of the Meiji and Taisho periods, Tokoname ware played an active part in the Japanese ceramic industry, giving rise to many artists, and among them, Inoue Yonan, being the highest. He ranks first among the contemporary ceramic artists in Japan. After World War II, the potters in Tokoname were producing mostly the I-hsing type ware. 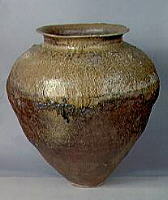 The present day artists of Tokoname are divided into the Japan Traditional School, the Japan Art Exhibition School, the Craftsman School and the Modern Art School Production of sculptural pottery has flourished since the Meiji period and continues to flourish today, so the Tokoname Sculptural Pottery Group has a relatively large membership.